Camila, selects materials which highlight the bold colors and exaggerated shapes of classic desserts. Utilizing such materials as fiberglass and epoxy resins, which are later hand-painted in order to attain a surreal glow, proof is given that her art is a matter of taste. Another unique aspect of Camila’s sculptures is that they are intended to invite the audience to interact with them. Touching is encouraged as much as changing what the pieces are wearing by adding a new scarf, fishnet stockings or sneakers to enter Camila’s whimsical world. Camila’s mentor who spoke of her as “The Salvador Dalí of Desserts” was the famous David Ferguson of San Francisco (Wikipedia), who has worked with both Andy Warhol and Jean Michel Basquiat. In 2017 Camila Valdez was honoured for the fifth year in a row by the National Salon of Visual Arts in Argentina www.palaisdeglace.gob.ar She is the youngest person selected in the 106 year history of the Salon. 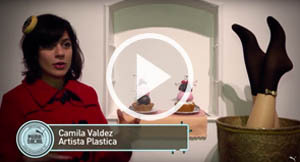 In 2015 Camila Valdez and her artworks debuted in USA. Many of her local artworks can be seen in the streets of San Francisco, California and online here. Camila Valdez is available for interviews in Spanish and English. 2010 – Graduated from Universidad de Buenos Aires (UBA) Facultad de Arquitectura Diseño y Urbanismo (FADU) Buenos Aires, Argentina. Degree: Industrial Designer. 2010 – Finished studies in Pattiserie, Chocolate and Candy Design at the Institute of Pasteleria Maestra (INPM) Buenos Aires, Argentina. 2002 – Graduated from International Baccalaureate (BI) in Superior Level of Arts and English. 2016 – The Red Victorian, San Francisco, CA. USA. 2015 – Universidad Nacional de la Matanza, Buenos Aires. 2015 – Watt Market, Buenos Aires, Argentina. 2015 – Autoria Buenos Aires, Buenos Aires, Argentina. 2014 – Universidad Nacional de la Matanza, Buenos Aires, Argentina. 2013 – Buenos Aires Design Recoleta, Buenos Aires, Argentina. 2013 – Art Parade, Buenos Aires Design Shopping, Recoleta, Argentina. 2013 – Arte Espacio, Hipódromo de San Isidro, Artista invitada, Argentina. 2012 – 2º Exposición, Museo Casa de Yrurtia, Buenos Aires, Argentina. 2012 – 1º Exposición, Museo Casa de Yrurtia, Buenos Aires, Argentina. 2011 – Galería Arcimboldo, Buenos Aires, Argentina. 2009 – Galería Appetite, Buenos Aires, Argentina. 2008 – Espacio Giesso, Buenos Aires, Argentina. 2017 – Donut Velocity, Aspect Framing Studio, San Francisco, USA. 2017 – Crowded by Beauty – Mc Guire, San Francisco, USA. 2017 – Lollapalooza Festival, Argentina. 2016 – GUM Galleria, Miami, FL. USA. 2015 – Art Revolution TAIPEI, China. 2015 – Burning Man Decompression, San Francisco, CA. 2015 – Sileo Art Gallery, Buenos Aires, Argentina. 2014 – Hipódromo de Palermo, Buenos Aires, Argentina. 2014 – Solange Guez Arte Contemporaneo, Buenos Aires, Argentina. 2014 – Universidad Nacional General Sarmiento, San Miguel, Argentina. 2014 – Puma Urban Art, C.C. Recoleta, Buenos Aires, Argentina. 2013 – San Diego Contemporary Art Fair 5 th Edition, USA. 2013 – EGGO, Centro C. Recoleta, Buenos Aires, Argentina. 2013 – Centro Cultural Borges, Buenos Aires, Argentina. 2013 – Puma Urban Art, C.C. Recoleta, Buenos Aires, Argentina. 2013 – Centro Argentino de Libro de Artista, Museo Galisteo, Arg. 2013 – Galería Grillo Arte, Punta del Este, Uruguay. 2012 – Galería Espacio Perotti, Argentina. 1996 – Compromiso Joven, Concejo Deliberante de Bs.As. Argentina. 01-01- 2017 白滑美腿甜品！- Legs Desserts! 24-12-2015 “甜食女郎大冒险”，有点太调皮 ! ”Sweet girl adventures” a bit naughty! 01-05-2014 FUZA Russia – Marvellous! Estudio – Atelier : Palermo, Buenos Aires, Argentina. Message sent. Thank you! We'll contact you soon. Follow our networks for oncoming exhibitions, news and more! Mensaje enviado. Gracias! Nos pondremos en contacto en breve. Sigue nuestras redes sociales para exhibiciones, novedades y mas!